The Mission Church council members discuss the possibility of applying to the provincial administration for additional classrooms for the coloured school which was being held in the small church in Oukloof. The chairperson indicates that he had discussions with the Mother Church who wants to provide land for the construction of a completely new school for the coloured children. 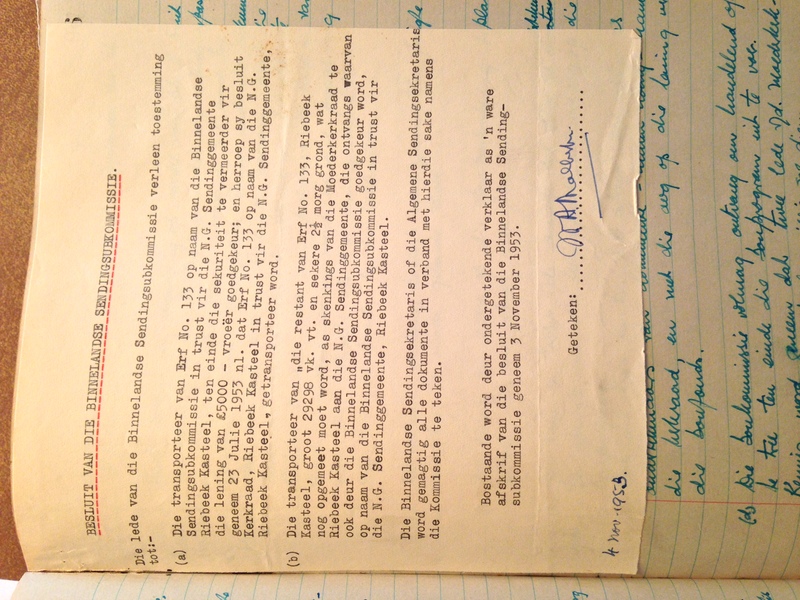 The Dutch Reformed Church transfers land (erf 133) [Five acres, 2 Ha) on the other side of the railway line for free to the Binnelandse Sendingkommissie [Interior Mission Commission) to build a new coloured school on behalf of the Mission Church of Riebeek Kasteel. Extra land tis also donated to use as security for a loan for the construction of the school. This school will be situated just over one kilometres from the town.